We were charmed by this classic cruise ship. Arrival is at a single story attractively appointed atrium; Handsome staircases lead up and down. Original art commissioned for the ship is hung throughout the ship. Classy touches of her original life have been perfectly preserved. Beautiful paneling, striking etched and stained glass dot the public areas awaiting your discovery. The Oceanbreeze is never ostentatious and is well designed and appointed. 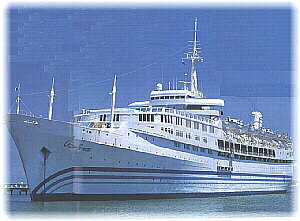 The Oceanbreeze exterior design is very different from any other ship that I have sailed. She is low and even her highest decks are still just a few stories above the water. It took a few days of looking at her from the distance to really adjust to the difference in her from the more traditional styling of the Seabreeze, Enchanted Isle or the Independence. Once aboard, her design was very easy to navigate. This is the first time I have not needed a map to find my way around for the first day or two. The only area that needs to be addressed as to location and function is the photo gallery. It is placed in a very busy area and causes a bottleneck. When you choose a cabin on this ship the old real estate maxim of location, location, location applies here as well. On newer ships deck location is just a matter of how close you are to the elevator. This ship only has one very small elevator so that passengers generally take the stairs. We didn't have a problem with the stairs and I did not hear of any complaints from other passengers, but it certainly is something to consider when choosing your cabin. In addition the lower 2 passenger decks are not as pleasant with narrow halls and unattractive stair banisters. All in all book as high up in the ship as possible and, if you can afford it at all, book a suite. Who would I recommend this ship to? Well-traveled people (or people who plan to be) who are interested in the destination. People who have not cruised will be pleased as well as properly qualified frequent cruisers. This ship has a big draw for people who are still working full time and who want to visit the Panama Canal but can not take an extended amount of time off from work. People who are a good fit will list relaxing at the top of their wish list and will be planning their books for the week as carefully as their clothing. We enjoyed being on a smaller more intimate ship with less than 800 passengers. There are plenty of like-minded people to meet without feeling like you are in a sea of faces. We enjoyed the feeling of being at sea on a vessel that feels like a ship rather than a big city resort. This is not the ship for the country club set or for cruisers who are active fun seekers looking for fast paced excitement. It is typical for the size and age of the vessel. The main show lounge is a single story and although attractively appointed and comfortable, the size in square footage and height of the show stage limits the type of entertainment that can be presented. Typical cruise presentations were pleasant after dinner diversions, however just as many people could be seen enjoying the open decks or enjoying one of the other musical presentations. There was a particularly good Latin duo who sang each evening in a lounge as well as a couple who sang boomer/yuppie style numbers. The theater was well attended and showed recent releases. Only suites have TV sets and they only play the movie being shown in the theater and any local stations that can be picked up. There is a large screen TV in the card room but I didn't notice many people watching TV there. The card room had a piano that was played by passengers as well as assorted board games and a limited selection of books in several languages. 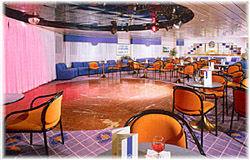 This is a large pleasant room located high in the ship and is a nice place to spend time. There are a generous amount of open decks. Two forward observation decks are perfect for watching the operation of the locks. Since the initial transit into the locks takes place in the wee hours of the morning, it was amusing to see cruisers who planned to snooze until the ship made it to the locks in the comfortable padded wooden lounge chairs on the covered decks. For the fitness buff there were exercise programs in addition to a small pool, sauna and hot tub. The gym is equipped with stair machine, Universal weight machine, exercycle and a very nice view at the rear of the ship. Deck walking is popular as is table tennis. There are massage rooms in the beauty salon area which is operated by Steiner. Eating is always an important activity on board. The food was high quality but was inconsistent in its preparation: Some dishes excellent and others poor. Some things were consistently excellent including breads, deserts and vegetables. Ordering out of sequence or an extra item did not seem to be a problem. If something did not appeal, the waiter would offer to replace with another selection. The Maitre'Ds were attentive and the waiters and busboys seem well trained and confident. Breakfast menus did not change in the dining room, cafe or through room service although each had it's own menu. Coffee was acceptable in the dining room but instant in the cafe. Expresso in the dining room is discouraged as there is only one machine and it is 3 floors away at the bar. The bar staff was capable, friendly and available. Prices and selection are standard for the industry. There was an adequate selection of better wines and a capable wine steward was helpful in suggesting appropriate bottles. 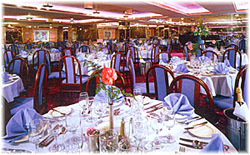 The Oceanbreeze is a Premier Cruises Ship. She sails on Sunday from Montego Bay. Two charter flights are used by Premier to fly passengers to Montego Bay. These flight were a pleasant surprise for us. We have been to Jamaica twice on land vacations. We were prepared for the long lines and drudgery of claiming luggage and going through customs and immigration......This was not the case! It was a breeze. We just handed over the forms we were instructed to fill out on the plane, smiled and boarded our air conditioned bus. We did not see our luggage from the time we checked it in at our first flight until it was promptly delivered into our cabin. Departure was just as easy. We claimed our bags, a porter took them to the charter flight line where TWA checked us in and gave us our boarding passes and processed our luggage. We then took our carry on bags with us to a waiting bus for a morning at Rose Hall Beach and lunch. This was a pleasant last day of the vacation at a beautiful beach. They are fresh and attractive. Some of the hall ways and passengers cabins were in the process of recarpeting. The casino is striking with 2 stories joined by a staircase with an art deco feel. All games are offered. Next door to the Casino is the gift shop. It is small but well stocked. The cabins show their age more than the public rooms. 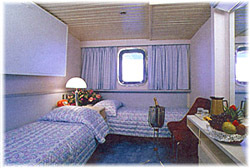 The company brochure has accurate photographs of the cabins. The bathroom is very small in the standard cabins and storage is limited, so only pack what you really need. Cabin Stewards did a good job and ours quickly provided any special requests. The Pursurs are on duty 24 hours a day and are friendly and helpful. The ship has a children's program and a dedicated children's room but on our spring break cruise many of the older kids were content to hang out. They seemed to find their own niche and the staff was gentle and accommodating to this unusual influx of youngsters. Other points aimed at kids but enjoyed by many are a small arcade with 10 machines who gracefully gobble quarters and Looney Tune characters who pose after dinner for photos. They can be purchased by placing a completed order form in the drop box by the shore excursion office. 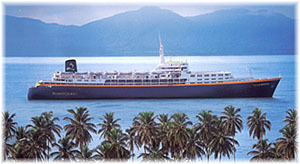 The Oceanbreeze is the only cruiseship offering shore excursions at Gatun Lake. You must purchase a shore excursion in order to obtain a tender ticket to go ashore. At the Yacht Club you will find complimentary shuttles to the locks, nature walk tours, local entertainers in traditional costume doing area dances and music plus complimentary soft drinks, beer, ice cream, snacks, hot dogs and hamburgers. Don't forget your suit as this is your chance to swim in the Panama Canal. There is a swimming platform and a lifeguard on duty. Another port call that is unusual is San Blas Islands. The Oceanbreeze enjoys a resident lecturer that will provide insight into the inhabitants and their culture. This is an unusual but pleasant experience and the shopping is interesting with hand sewn articles offered in great abundance. I bought T-shirts and I washed them with apprehension. The vivid colors on the white background seemed risky. We bought 6 shirts and all of them came through the wash perfectly. During your visit to Columbia, I would suggest a ship sponsored tour due to the political climate. We felt safe during our ship sponsored trip and we saw all of the things of interest to us. Costa Rica was a pleasant stop that we have targeted for another visit. One day was not enough for us to see the country to our satisfaction. We were there on Good Friday so much of the town was closed but we saw enough to know that this is a place to return to. There is not a self service laundry but the ship will do passenger laundry for a small fee. Don't miss the bridge tour. The old fashioned original navigation equipment is still in place and all of the ultra modern navigation equipment has been added without disturbing the charm.